Issue: The number of keys available in the Verbiage Editor of the SecureAuth IdP is substantial and can be daunting to navigate through. 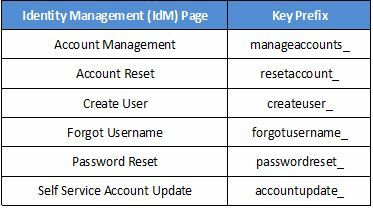 The following table lists the IdM page and its corresponding prefix in the Verbiage Editor section. For example, keys related to the labels in the Account Management page begin with "manageaccounts_," and so forth.